Knot Vista,er uh,Knot AERO I mean,has been updated...a lot...for XP,Vista and Win7. 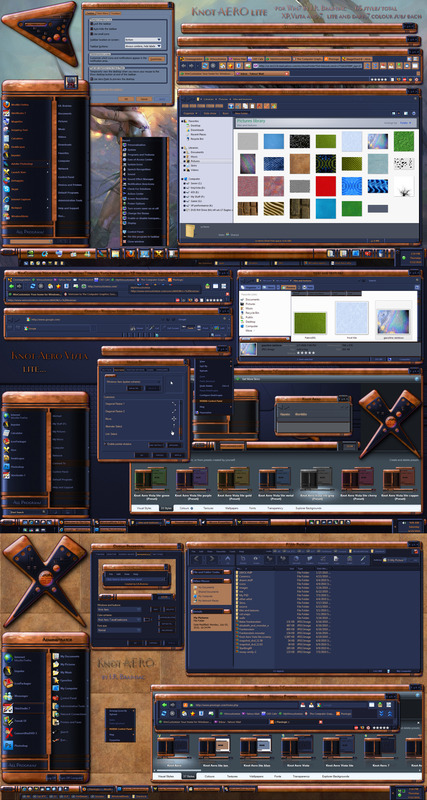 65 styles total,with lite and dark plus 7 colour presets for each main style.Seperate large superbar and Small Vista-like taskbars for Win7. Aero.WBO7 file.There are 3 .WBO7 files in the folder.Knot AeroXPV.WBO7 for the Xp and Vista colours. (these are the colour presets you will see when you install the skin) and Knot Aero7.WBO7(this is the one you need to open to get the Win7 colours) and the original,Knot Aero.WBO7. method 1. open Knot Aero.WBO7 and Knot Aero7.WBO7 with notepad and copy all of Knot Aero7 to Knot Aero and save.Reopen WBconfig and now you will see the Win7 colour subs. Easy peasy.Sorry to make Win 7 users work a bit but WBconfig was choking a little on 65 styles. wow...additional artiste...Redneck Dude,chris161,BigDogBigFeet,J.Aroche...with possibly some new names to come...hmmmmm...WebGizmos,blkgarbageman,Natas2...maybe?No promises,no pressure heheheh. Dude it looks so damn sophisticated. Would love to see the same wood theme but without the blue metal look. Although from an artistic point of view its class and works really well together. Wish someone would make a IP for this. Welcome home Knot veesta wb! Very nice , like that. Do you think? Pretty sweet, dude! Just purchased it and installed it (along with all the other goodies that suite-en it up some more ) And I must say, it has a lot going for it. Elegance. Pure and simple. Luv the fact you have included a widescreen version of the wallpaper to offer. Looks pretty spiffy on my 22" LG Flatron Wide. .-= The Reaper Man =-. I got this at the bargain store awhile back. Best deal I ever made. Kinda like getting the Mona Lisa for the cost of lunch. The texture and smoothness is just breath taking. The wallpaper is stunning and the Xion skin is simply the best. I have been watching all the old Star Trek shows and I'll be damn if I know how you ever learned to skin like this but please, keep it up. I really like this. I wouldn't mind having a version with lighter system colors too.